Col.Flagg: Burns, you interrupt me like that once more, I’m allowed to bite off your right ear! Another great Flagg line: "My father touched me like that once. To this day, he still wears orthopedic shirts." Note: There is a very similar line delivered by Danny Vermin (Joe Piscopo) in the movie Johnny Dangerously. That line is, "My father touched me like that once...ONCE!" How about Radar's responses in Love Story: "Ah, Bach!" "That's highly significant." And, "I consider that horse-and-buggy thinking." I wonder what ever happened to that nurse. And that reminded me of Radar's line at the end of Springtime: "I think I've been slaked!!!!!" In Tuttle, during Hawkeye's eulogy for Tuttle, he says "there's a little Tuttle left in all of us. In fact, you might say that all of us together made up Tuttle." In Welcome To Korea at the end BJ gets out the the Jeep and says to Burns, "What say you, Ferret Face?" Col. Blake to General Clayton: We need a nug ...a, ww04 nug sir... ! (Frank turns the ordering guide right side up)...ah, that’s a gun, a 40mm gun sir! “...it’s already even hard to remember how Turtle looked, how he walked, his little laugh...”. These are all some of my favorite lines! Who said...Reno, that’s my home town! Radar, go. Stay. I said go ...And I said stay. She outranks you... She's got more things on her uniform. She's got more things in her uniform... but go! I'm gonna break his leg, set it, and break it again! Feel that. If he lets everybody feel them, there won't be anything left but a package of lint. Radar, you can call me colonel or sir, but you don’t have to use both. You think you’re smart don’t you? But you’re not, you’re dumb...very dumb...but you’ve met your match in me! Oh, funny man! I’ve got the book on you Hunnecutt. I can play that game too! 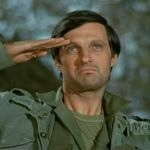 Potter to Klinger in Change Of Command: "Horse Hockey"
Hawkeye and Frank get into a dispute on the bus bringing the wounded to the 4077 after Burns screws up triage and tells Hawkeye that it's mutiny and he's in charge of the bus/triage. Hawkeye: Mutiny on the bus, it was a B movie. They couldn't afford a Bounty. Allen Jenkins played the bus driver. The General Flipped at Dawn... Radar reads off the clipboard like it's the sports pages covering a model yacht race at the 4077's sewage pond. Hawkeye: Ah, that Polonsky has the sea in his blood. The remainder of the contestants didn't finish due to a sudden undertow after breakfast. Col Blake: here’s an oldies, but a goodie... half the family died, other half pregnant! ...and Bouncing Betty wins by a ... by a... the winner is Bouncing Betty! Is that an order sir? Sure sounded like one to me Radar!